A small wire can protrude through the fabric of the ears on these headbands, posing a risk of injury. 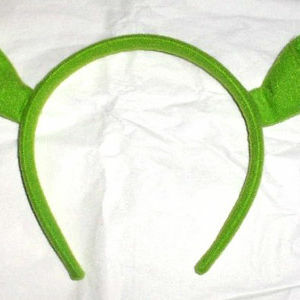 The recall includes about 6,000 Shrek ear headbands made of plastic and covered in bright green fabric with two ears similar to those of the character Shrek from the DreamWorks film series. A tag attached to one of the ears reads "DREAMWORKS" and "THE THIRD," and shows the top of the Shrek character's head. Paramount Pictures to Pepsi Bottlers which distributed the headbands as a giveaway product to their employees from February 23, 2007, through April 1, 2007. The recall does not include any ear headbands purchased, or distributed free of charge, before February 23, 2007 and after April 1, 2007. Immediately stop using the headbands and call for information on returning the headbands to receive a free replacement item. For more information, call Pepsi at (800) 782-6116 between 8 a.m. and 8 p.m. ET Monday through Friday.